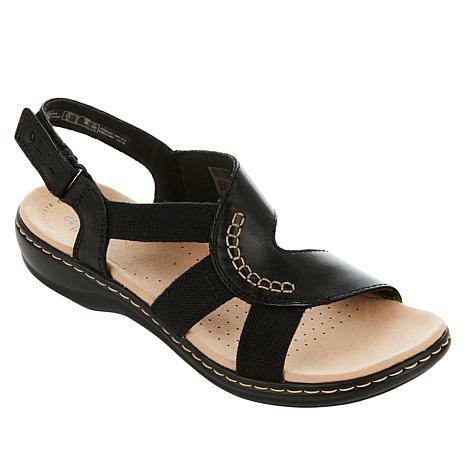 Enjoy the sunshine in these cheerful leather sandals from Clarks. 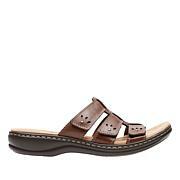 The molded, lightweight Ortholite® footbed, flexible EVA outsole and textile straps provide the perfect fit with all-day comfort. These sandals are a great buy! The fit is "spot on", which I appreciate as my foot sometimes falls between sizes. The 9M worked perfectly and I did not need to go up a size. I also love the look and feel of this shoe. They have arch support and have been comfortable for me for hours at a time. I went back and ordered two more pairs at this price! Great way to take care of the basics in your summer wardrobe! Really cute shoe, fits good, but I received a pair that doesn't have very much padding in the heel. 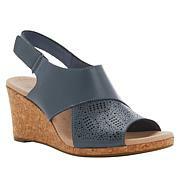 I have plantar fasciitis and my heels hurt and need the extra cushion you usually get with a Clark sandal. Not this one.. it's going back.